We started back this week with our homeschool preschool activities and I thought it would be fantastic to focus this month on all things winter! Since I plan monthly themes in our homeschool preschool planner, I had to round up some fun activities to fill it out. I created a winter preschool activities calendar to pull all of my ideas from. Several of these ideas were found on Pinterest and saved to my Winter Preschool Activities board. Some of the ideas are snacks you can make, books you can read, and crafts you can do with your preschooler. I typically plan about one craft per week. More than likely we will not do everything on this calendar. I just love having a huge list of activities to do. I will save this calendar and use it in the years to come with my younger children, too, when I plan a winter theme for their preschool. One of my favorite things to do when planning our preschool activities is put a bunch of books on hold at the library that correlate with our preschool theme. I encourage you to use your library as a resource, too! I’m particularly looking forward to our hot chocolate day and painting a snowman with puffy snow paint! 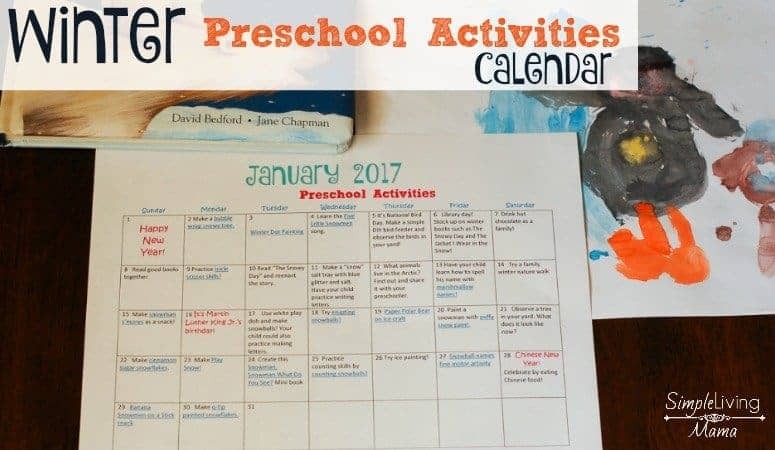 I’ve decided to make my monthly preschool activities calendars available to all of my subscribers. Be on the lookout for a new calendar each month if you want to follow along with our themes for 2017! Each calendar will have links where you can find information on how to make the craft or snack. I hope you enjoy these calendars and they are helpful when you plan your homeschool preschool lessons! If you need help planning your own preschool lessons, check out My Homeschool Preschool Planner. You can see what all of my monthly themes are, and you even have space to plan out your own!